"Your magic show was terrific! Both children and adults were very involved. One thing I noticed immediately was the clarity of your show. The Crossings Park is a huge venue and it can be difficult to hear individual performances over the noise of the crowd, generators, and other entertainment. Your show was crystal clear and easy for the younger audience members to follow. "You kept them in stitches!" That's how one mom described the action packed magic show performed by Melvin the Magnificent for her son's fifth birthday. 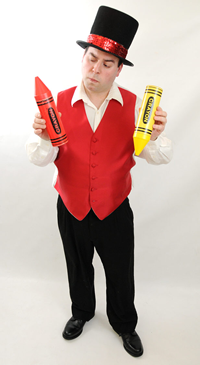 Melvin the Magnificent, a professional magician played by Joe Goode, has been performing for over 20 years with credits ranging from annual performances for Saratoga's First Night celebration, to an overseas Armed Forces Entertainment Tour by order of the US Pentagon, to birthday parties right in your neighborhood. From big events to small parties, his shows are action packed, interactive, and sure to bring huge laughs from the entire audience. In addition to performing, Melvin has written lectures and presented them to professional children's entertainers across the Northeast. He also teaches magic classes for kids and adults, ranging in every skill level. The book used was written by Melvin himself to meet the needs of a modern day magic class, so students know they are getting the best magic instruction in the area. "The best sound in the world is the laughter of children." 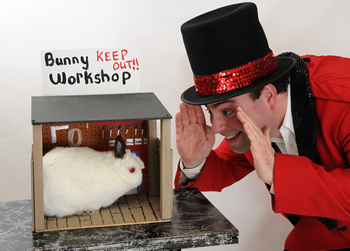 The Metroland's "Best Of" winner is accompanied by his magical assistant, Hocus Pocus the Magic Bunny Rabbit! Hocus Pocus always makes a big appearance at Melvin's shows, and at smaller engagements, children can get a chance to pet and take pictures with him afterward.